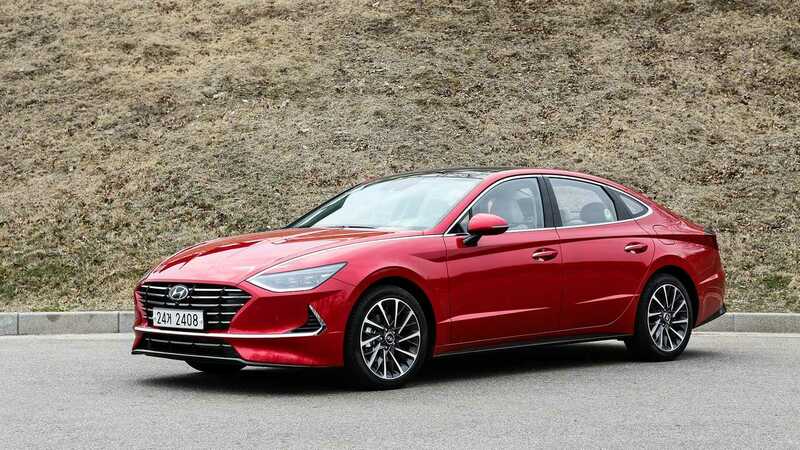 The 2020 Hyundai Sonata ushers in the eighth generation of Hyundai’s mid-size sedan, and this latest redesign from the Korean brand is the model’s most extensive yet. While crossovers and SUVs are steadily biting away at the mighty midsize sedan segment, Hyundai believes sedans are still worth building and selling. 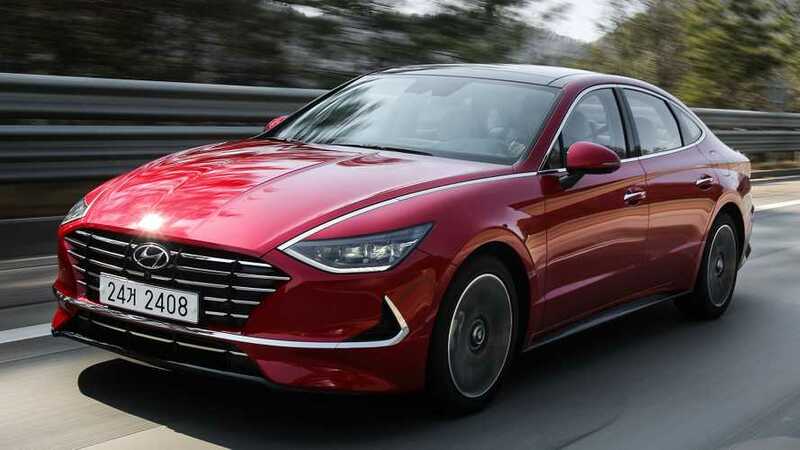 We spent a full day driving the next-gen Sonata from Seoul to the Korean countryside, as well as logging a brief stint on Hyundai’s Namyang high-speed test track to see that the company’s extensive efforts improve every facet of the car. Lee successfully injects a bit of high-dollar pedigree into this mass market car. The front-end pinches down like an Aston Martin, the proportions are grand, and the all-new platform the car sits on stretches the Sonata nearly two-inches compared to the current-gen. There are a few interesting flourishes, as well: one is a neat visual trick that makes the chrome strip that extends from the headlights up along the sides of the hood, illuminate when the car is on. It looks striking, especially when catching a glimpse of the Sonata in the rear-view mirror. There are also aero-pins on the taillights that are a sportier accent than anything else in the segment currently offers. Hyundai calls this new design language Sensual Sportiness. It’s an apt title. 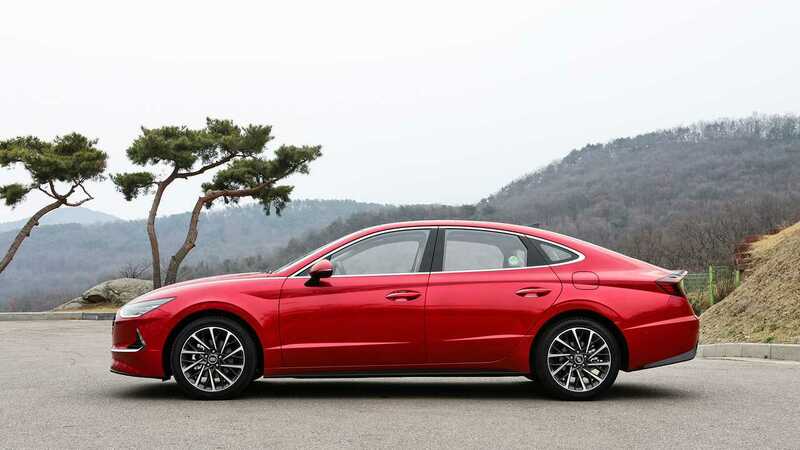 Lee is aware that some buyers may shun the bold design, but he and Hyundai believe that if there’s any hope for the segment, mid-size sedans have to attract a younger buyer; or at least catch the gaze of those that might not ordinarily look at a car like the Sonata. In practice and on the road, the car looks far more premium than anything in the class, save for the Mazda6. Step inside and you’ll find a cohesive, clean, and modern interior. Our model featured an upper-end, Mercedes-esque 12.3-inch touchscreen infotainment system in a curved, driver-centric cockpit, as well as a 10.2-inch digital instrument cluster. The infotainment is straight-forward and user-friendly. There’s a new steering wheel design, slim air vents, lots of piano-black finishes, as well as chrome and faux-leather, which complements the Nappa leather seats. The center console is made of hard plastic and doesn’t look as premium as the rest of the cabin. There are small details, too, that give a more premium feel than one expects of a car that will likely start at just below $24,000, and top out around $35,000 with all the bells and whistles. 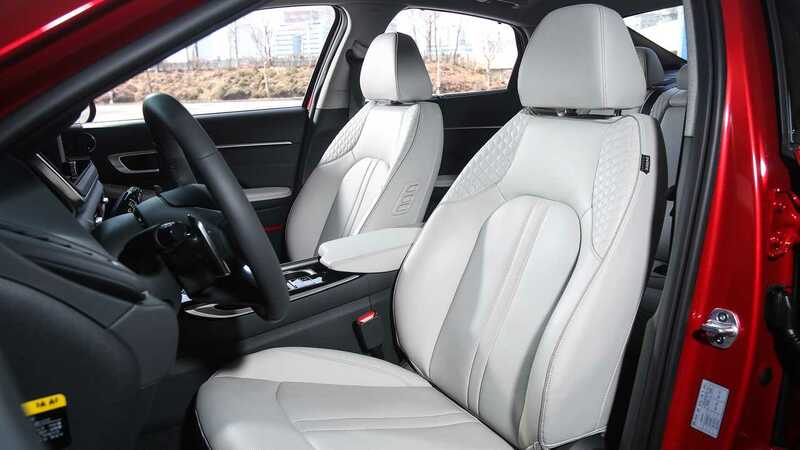 The headliner is cushy – your fingers sink into it – and there’s attractive stitching on the rear seats that we’re used to seeing on top-end luxury cars. Hyundai believe that if there’s any hope for mid-size sedans, they have to attract a younger buyer. Console-mounted push buttons replace the current shift lever and affords additional space for large storage nooks, which house a wireless charging pad (though we noticed our phone was warm after 30 minutes of resting on the charger), a 12-volt 180-watt plug, and two USB ports. Temperature is controlled via tactile Audi-like knobs. The rear gets some love, too. 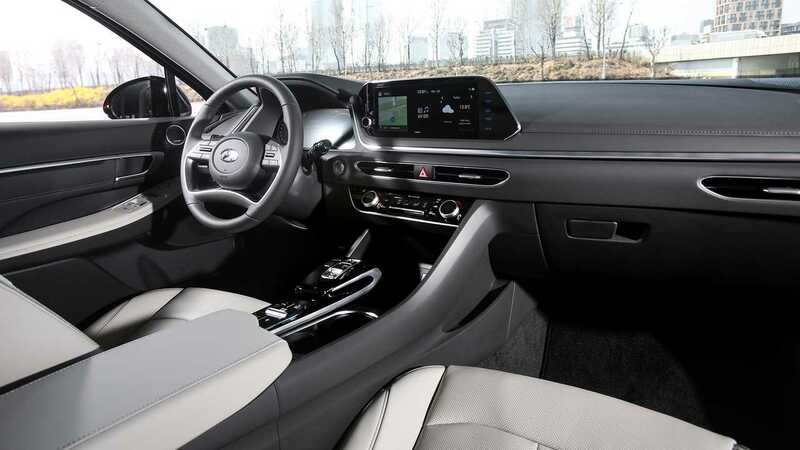 There’s ample knee and leg room, sufficient headroom for normal-sized adults, a middle console that folds down with two cupholders, chrome-trimmed door handles that match the exterior, and a thin, slim gap to slide your hand in to close the door shut – it doesn’t sound that cool, but it is. The models we drove were Korean-spec production cars, fitted with an anemic 2.0-liter four-cylinder engine and a six-speed automatic transmission. The setup is good for 158 horsepower and 145 pound-feet of torque. To put it mildly, this engine lacks power, and there’s a noticeable lag between accelerator application and when the engine actually starts to deliver power. Thankfully, the U.S. gets a host of more powerful engines. A naturally aspirated 2.5-liter inline-four serves as the base powerplant and it’s good for 191 hp and 181 lb-ft, while a turbocharged 1.6-liter four-cylinder boasts 180 hp and 195 lb-ft of twist. A turbocharged 2.5-liter four-pot will eventually come – likely sporting an N or N-line badge. Albert Biermann, head of research and development for Hyundai and former head of BMW M, indicated a definite and significant power bump is sure to come soon, but he couldn’t speak further on it at the time. While the Korean-market setup is wholly insufficient for the U.S., we logged a couple of laps on Hyundai’s Namyang high-speed test track in a Sonata with the 1.6T engine and an eight-speed automatic transmission. Acceleration felt quick, and braking was excellent. We noticed Continental summer rubber on the wheels of our test car, although we’re told the U.S. market model will wear all-season tires. 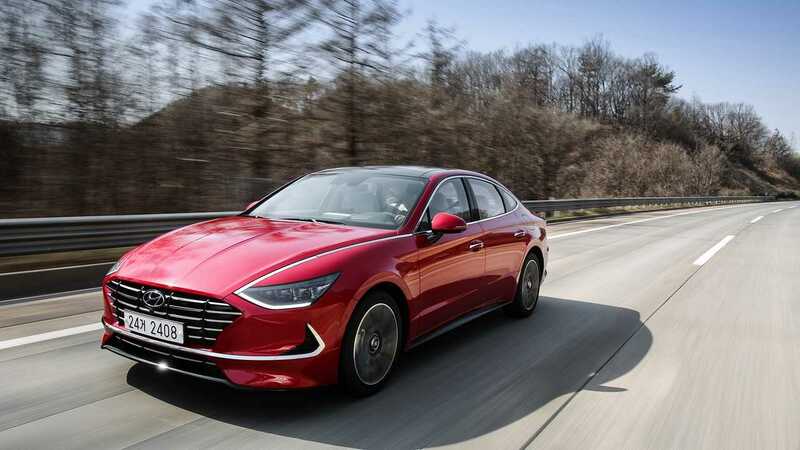 We’ll want to spend more time to further evaluate it, but our brief stint in the Sonata 1.6T alleviated our concerns about the lack of power from the Korean-spec model’s powertrain. The suspension damping will also change slightly for the U.S. market. 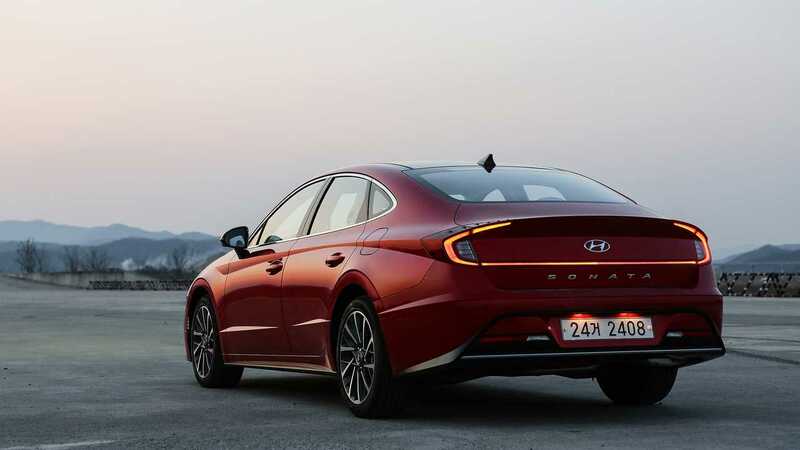 Generally, the Korean market prefers softer damping than North America, although we wouldn’t mind if the U.S.-market Sonata were a bit softer than this K.D.M example. The light steering feels well-weighted and predictable. Despite Hyundai’s efforts to improve noise, vibration, and harshness (NVH), there is some discernible road noise and wind noise that enters the cabin at highway speed. This is something we’ll want to test on our own roads, but we suspect these issues will persist on North American-spec Sonatas. Hyundai turns turn signaling on its ear with its new blind spot cameras. Flip the indicator to signal a left- or right-hand turn and the speedometer (left) and tachometer (right) switch to a live feed of that particular side’s blind spot, so the driver can watch for traffic. It fills in the gauge circle, and once the turn is completed, it resumes the digital skin of the instrument gauge. It’s essentially a more advanced version of Honda’s LaneWatch, and generally something you’d expect on a car in a pricier segment. Additional safety gear is generous, with the latest version of Hyundai’s adaptive cruise control, as well as automatic emergency braking, and a clever lane-follow assist system, which cuts much of the strain out of highway driving. Like similar systems from Volvo, Hyundai's system can manage driving duties for a short time, even if we (or the automaker, for that matter) don't advise such behavior. We managed to keep our hands off the wheel for about 16 seconds and 25 seconds (in the two instances we timed) before the computers requested we resume control. That’s gives drivers an impressive level of leeway – normally these systems closely monitor steering inputs to make sure the driver is still alert, despite the car doing most of the work. It felt like the system could have lasted longer, too, had we not been on a windy, trafficked road. 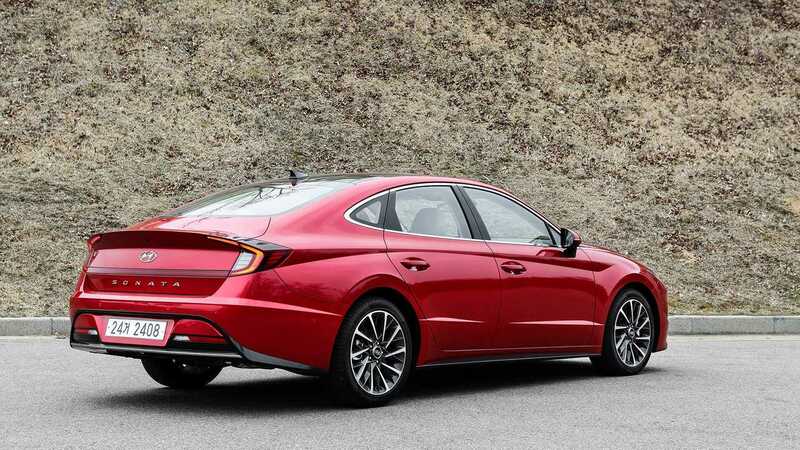 The 2020 Hyundai Sonata will arrive later this year, boasting fresh, elegant, bold styling, and a modern and cohesive interior. With an eventual range of engines and power bands to suit all tastes, new technology, and a wide array of standard content and features, the Sonata will be an even more -alluring sedan in a shrinking segment.